Yippee!! 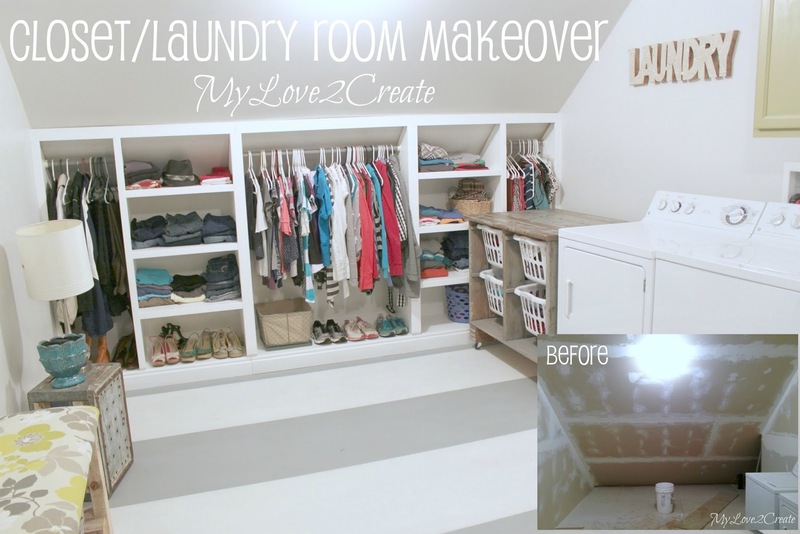 It is finally here my sister's Closet/Laundry Room Makeover Reveal! Can you believe this? Seriously...it is amazing what can take place in only six days. Oh, and with a TON of stinkin' hard work, awesomeness, and superlycoolamazinglyrockin' (I totally just made up a new word) family to help! 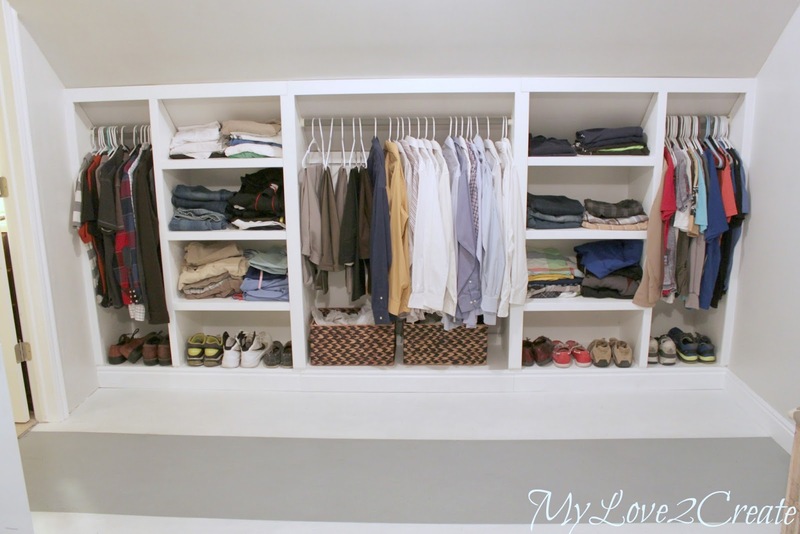 And inspired is exactly how my brother-in-law felt after seeing MY Master Closet Makeover. 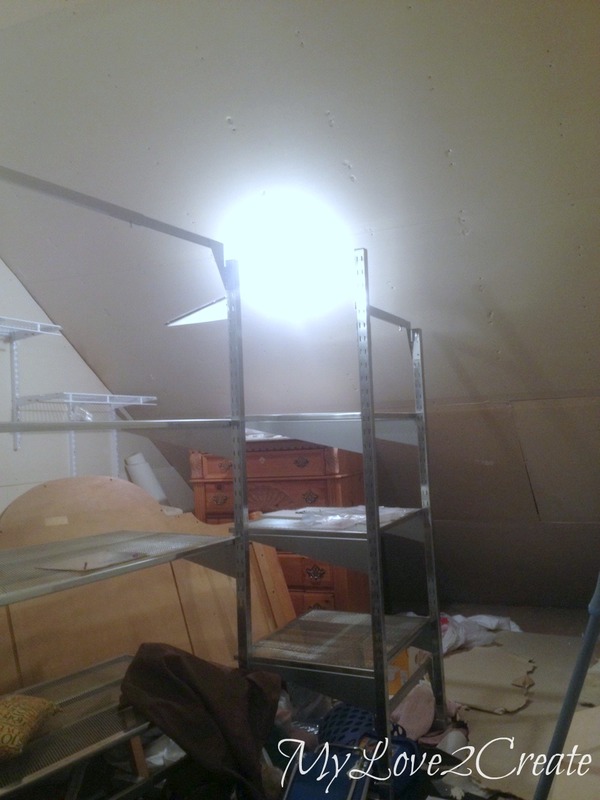 Inspired, that is, for me to help makeover their new closet/laundry room during my spring break. What?! Don't get me wrong, I was seriously game, and even excited for the challenge. But a week, need I remind you that it took me a month...A MONTH to do my closet???? Upon my arrival this is what the room looked like, my sister (with the help of another sister) had taped and mudded (one coat) the drywall. Sa-weet! This shot is taken just inside the door looking to the right. This is a shot of the wall directly to the left when you walk in. And lest you think I would dare waste any space, we have removable rolling walls!!! Oh yeah baby! 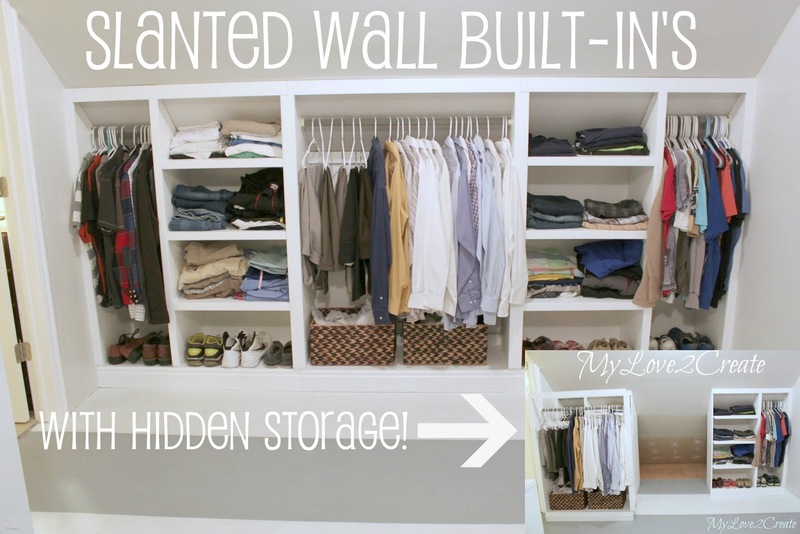 This closet is rockin' the hidden storage. Probably my super favorite feature! And if you have a keen eye, you have noticed the DIY Upholstered Bench that was made completely from free stuff! Update, you can see how I made the Slanted wall built-in's here! Doesn't it look so nice and comfortable? My Sister has six adorable kids, just like me (same ages too!). 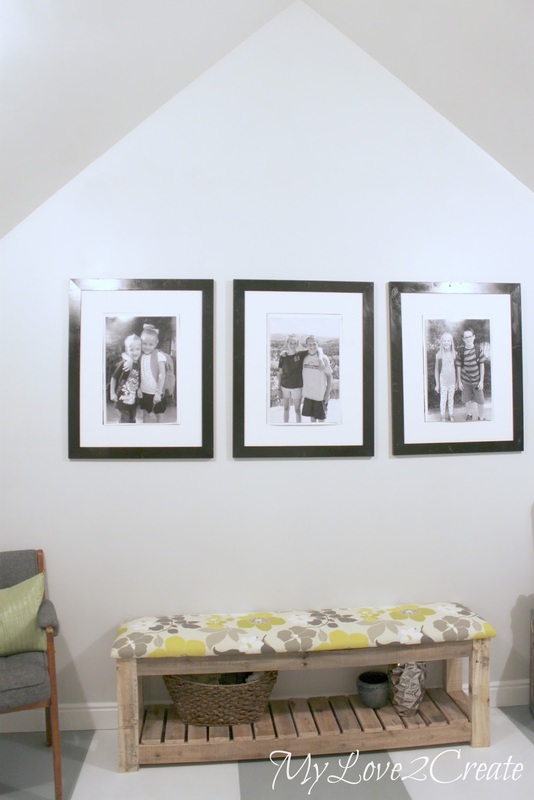 I love that they are the stars of the room, those frames were $5 each. No lie! I got them almost two years ago at my Restore. I had to call my sister and see if she wanted some. And off course she did. I think even I would be excited to do laundry here! 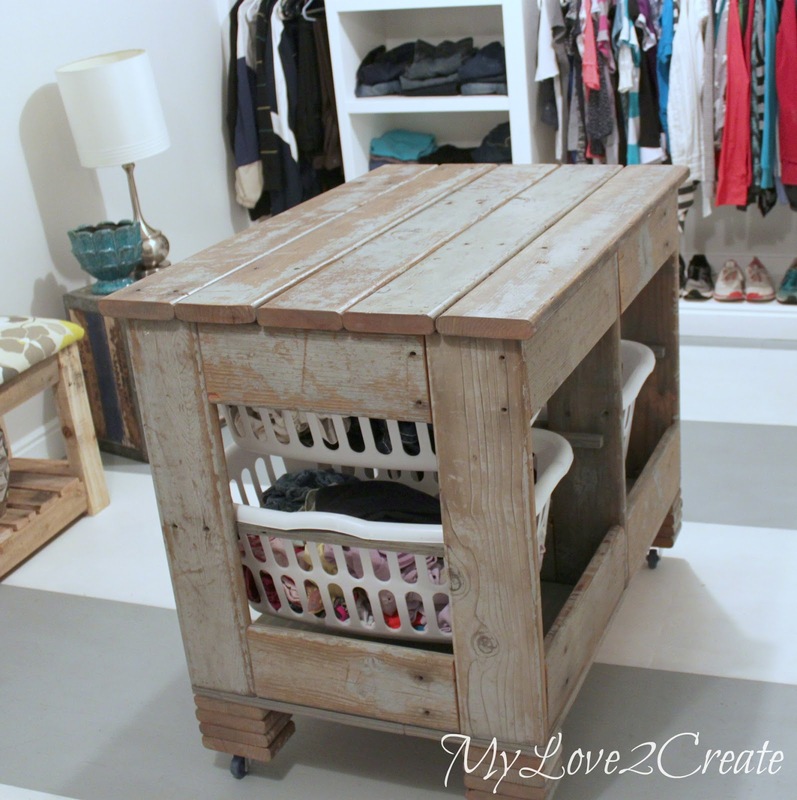 You can check out the Old Deck Wood Laundry Crate I made. The cute blue wheel thing was in the garage collecting dust, I loved it from first sight. The cabinet is hiding a power box and sporting laundry detergent. It was a last minute project. The doors were in the garage, and I built the cabinet for the back of them. Not the cool open shelves I envisioned, but free! My sister bought the cute "laundry" word. My Brother-in-law's side of the closet. You can see we didn't paint the floor all the way back, or the wall for that matter. 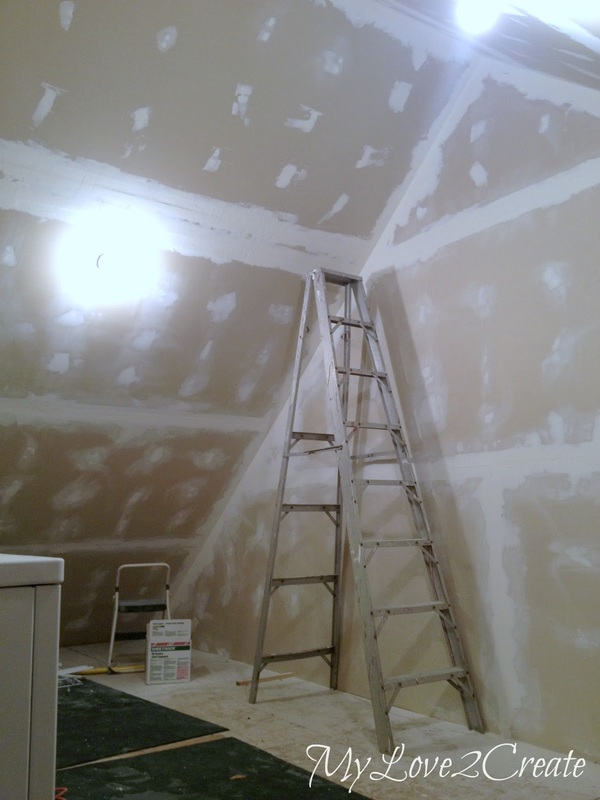 We knew it would be hidden and we were on a tight budget, so no wasting paint! And yes, we painted the subfloor, doesn't it look amazing? I. love. it. I designed the roll out sections to look totally built in when they are in place. I'll bet you couldn't tell they were meant to move when you first saw them. See, hard to tell right? All that storage, out of sight, out of mind. Until you need it of course. Pull it out for easy access and laundry business. Still a little jealous of this cutie. 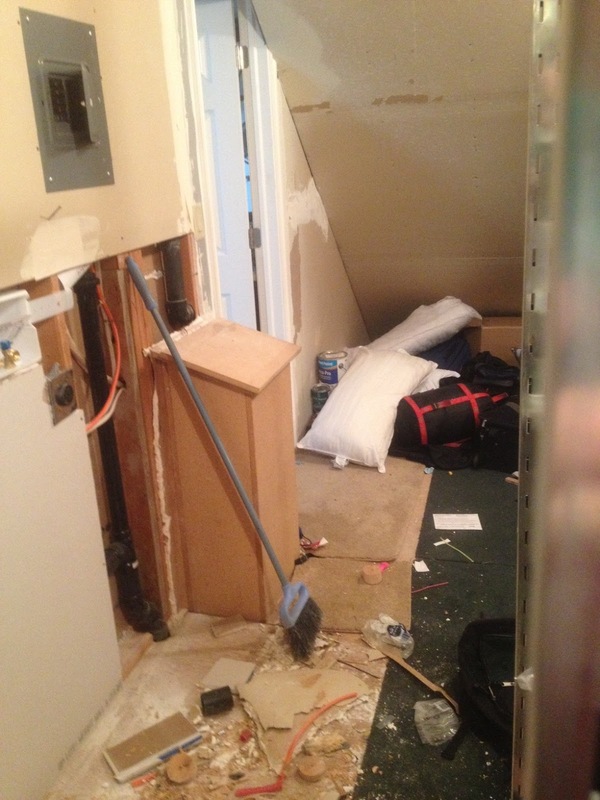 Anyway, here is a shot looking back at the bathroom door, so you can get a better feel of the room. Here is a shot right as you walk in. So let me just say that the chore I have always loathed is laundry!! Ugh...constant never ending, always everywhere, hardly ever folded laundry! And when you have 8 people to wash for, that also means that you have 8 peoples lives to schedule, which means you don't have time to be doing laundry constantly! 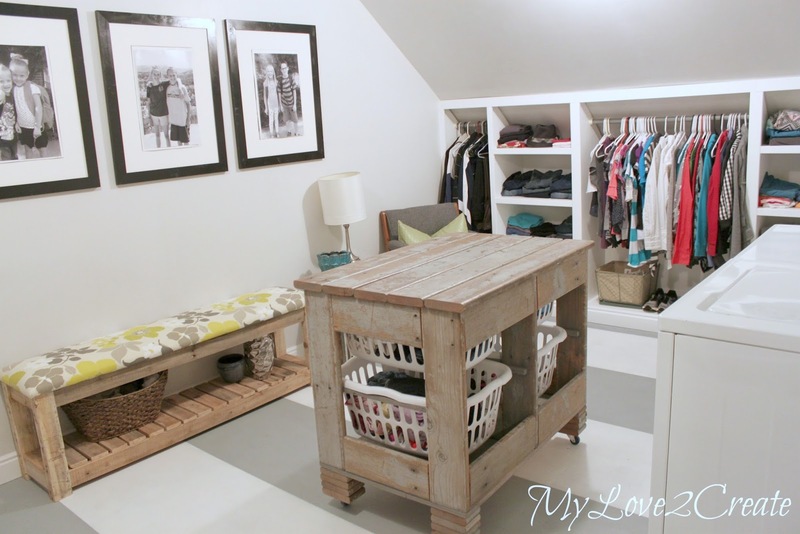 That is why i am absolutely IN LOVE with my new laundry room/closet!! I want to scream from the rooftops the difference a second washer and dryer can make! Add to that the fact that I can put clothes away straight from the dryer, with out lugging them up and down stairs, I've never been so happy to do laundry in my life! I have the best sister in the whole world! Seriously, the BEST! 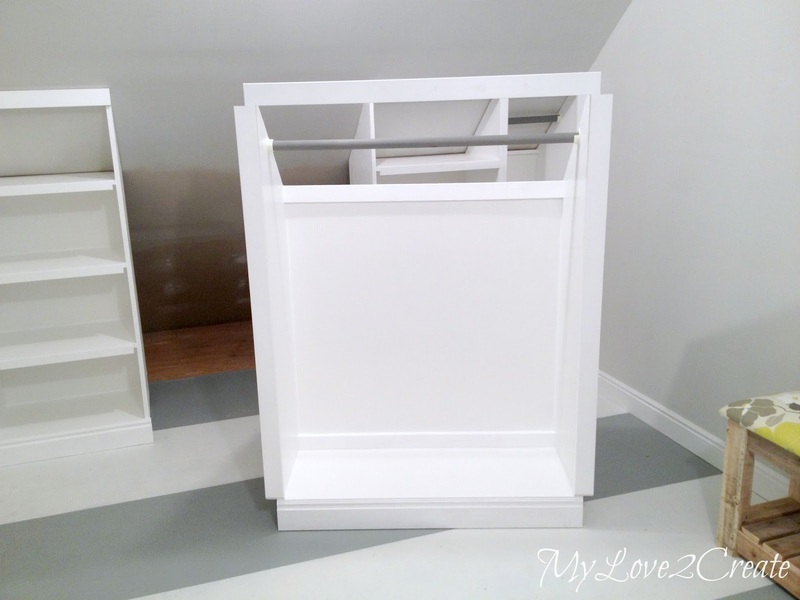 I cannot believe that she designed the closet organizers herself, built them, (with a secret roll away section I might add..) and they work perfectly! I love being able to keep sleeping bags, suitcases, boxes, all hidden away. And our clothes stay nice and organized on the other side. The laundry cart is Perfect for what we need, and being on wheels has been sooo convenient, and it is adorable! The bench is awesome sauce, I love it . Every time I walk in I am in awe of the transformation that took place in 6 days! I also can't believe that we added a room onto our house, for hardly any money! I am also blown away by Mindi's talent and skill level, and so beyond grateful to her for hard work. She is an inspiration to me. It was a crazy week, physically and emotionally exhausting. I loved getting to learn from her, and maybe one day I can be as cool as she is! I Love you Mindi!! Awww, so sweet! I promise I just asked about the room...Thanks Kaelynn I love you too!! 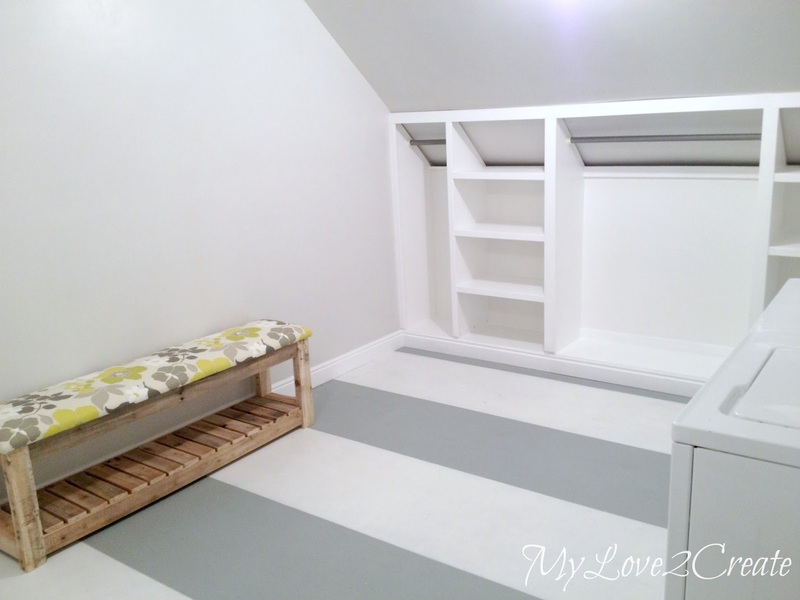 If you loved this room makeover please share it! Stay tuned for future tutorials (slanted wall built-in's and How to paint a subfloor) on how this room came together, and some fun shots of my family helping out, because there is NO way I could have done this by myself, they are the reason this room looks so amazing! Thank you so much for stopping by, and have a very Happy Easter Weekend! Wow wow wow wow WOW! You are so talented! 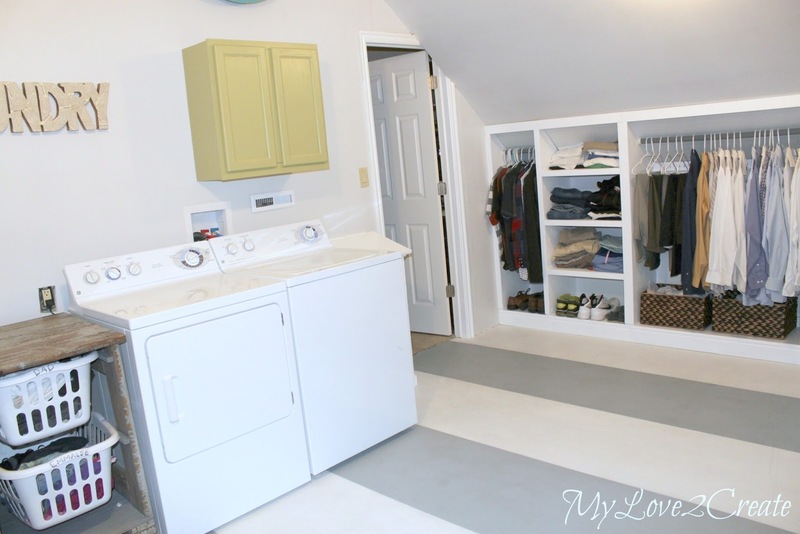 What a gorgeous laundry room! 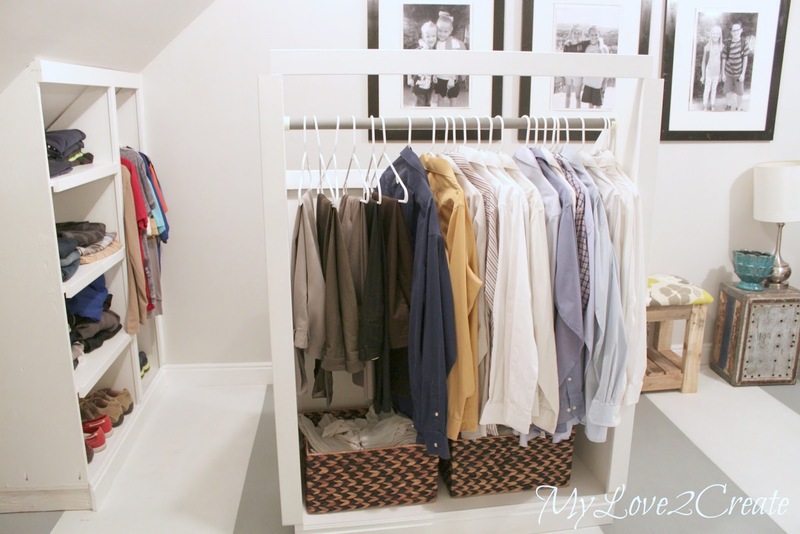 I love love those rolling closet organizers! Genius! Mindi, this is so amazing! I can't believe what you were able to do in such a short time. You are seriously inspiring! By the way, I went to GVHS and was in the Green Valley Stake, but I was right between Kaelynn and Karen so I never knew you. 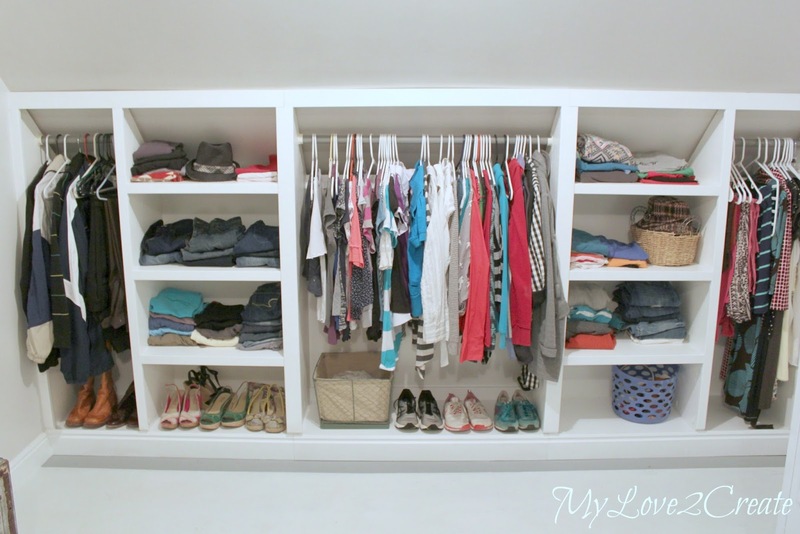 I found your blog when Kaelynn posted about your closet on Facebook, and I'm loving it! Okay - I am feeling like hanging up my power drill! This is amazing! I am in awe! The slanted "built-in's" on rollers are amazing and so clever! Seriously - I am depressed! Thanks for the inspiration. I want to be like you when I grow up! Oh dear, I'm 53 years old! Is there time? Nothing short of BRILLIANT !!! I'M in love with this idea !! Way to go !!! I got to see this project in progress since we popped in on them during our vacation. I have been excited to see the finished product and it truly turned out awesome. Wow guys- good job!!!!!!! Bam! Nailed it! 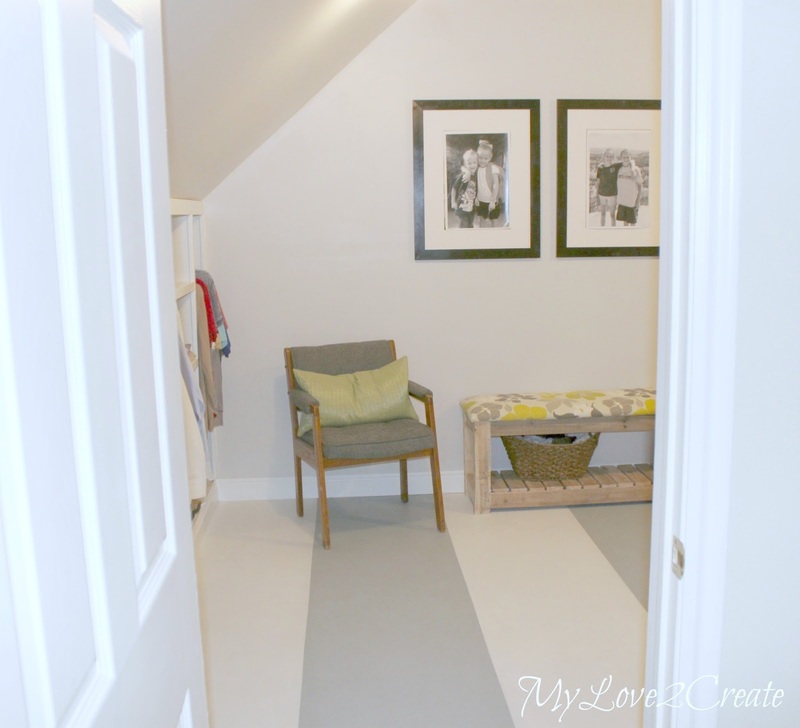 Mindi, that room is inspiration! I am so in love with those rolling cabinets. I literally said out loud, "She did what?!" lol I love the hidden space behind them. 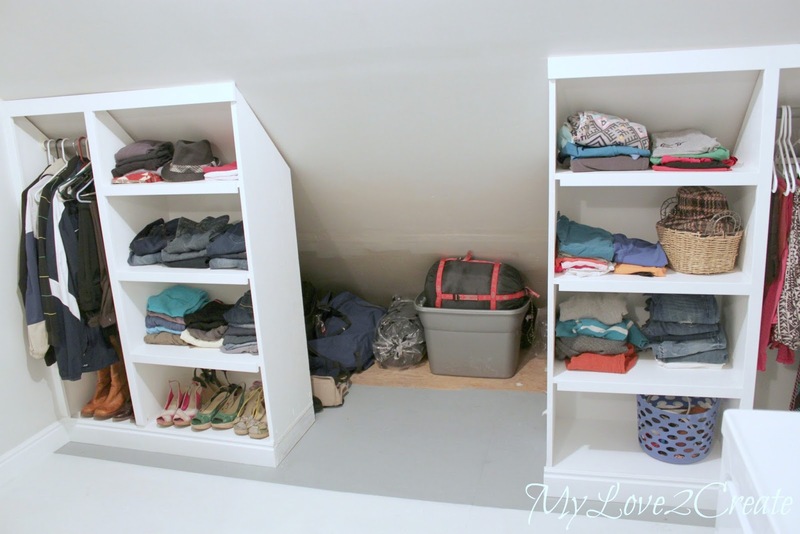 One could store all kinds of stuff or the kids could just go and hide out with a flash lights, books, toys and snacks. lol ;) The floors are amazing and everything is decorated nicely. What a lovely, bright and happy room. Lady, we need to hang out so I may learn from you. ;) Have a lovely Easter weekend! Wow, Mindi! I am so impressed! This is absolutely amazing. I knew you girls were working on that closet, but I had NO idea! Roll-out shelves....great! Washer and Dryer where the clothes are...fabulous! You make yo' Mamma proud, girl! 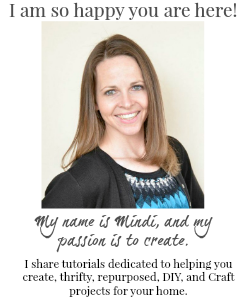 I am constantly blown away by your talent and skill level too Mindi! WOW! What an amazing and gorgeous and organized fabulous space. Pinned for sure! Words can't even describe how beautiful that room is. I am so jealous. You had me at rolling-cabinets! I instantly thought "great place to hide Christmas presents!" Fabulous job! You should be so proud of yourself. Thanks Elle!! 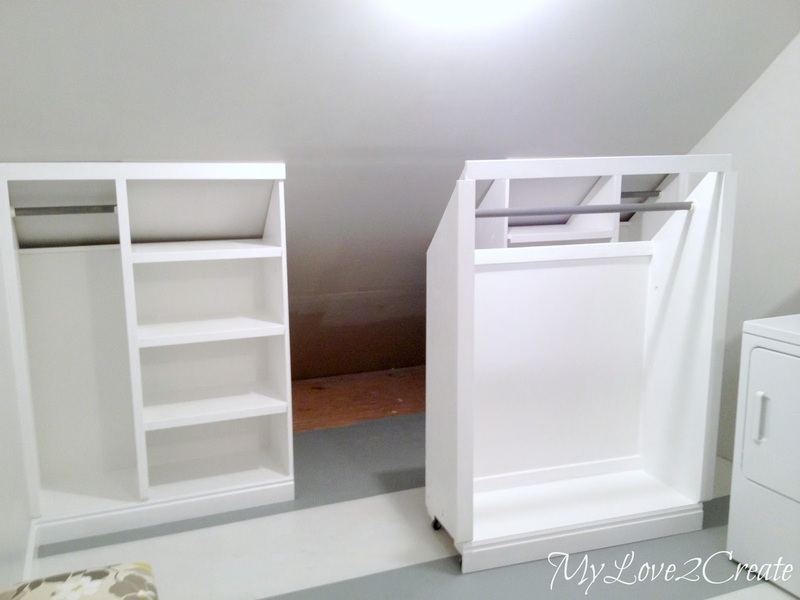 Yes I did make all the cabinets from "scratch"! I am hoping to get a tutorial up sometime next week! I love this! I want to do this in my next house for sure. I love how organized and fresh everything looks. You are amazing! 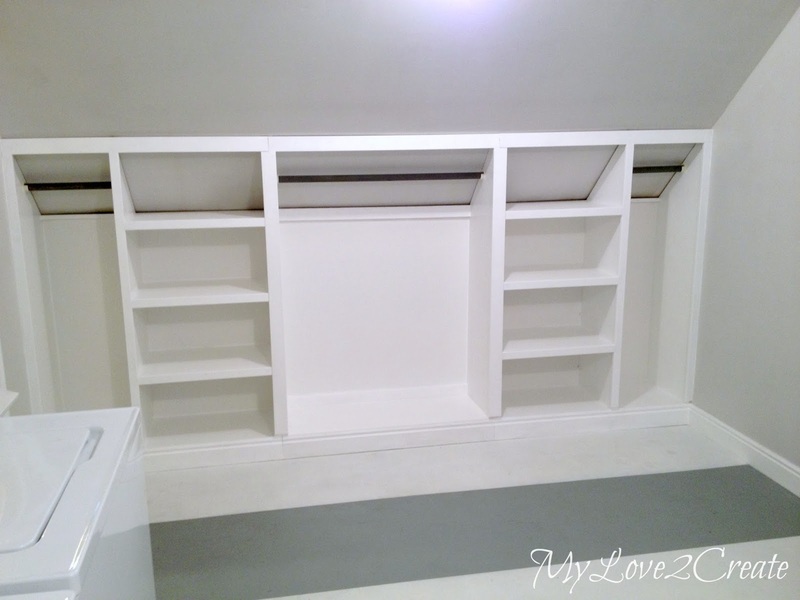 My jaw hit the floor when the storage rolled away from the walls to reveal the hidden storage. That is so fab! 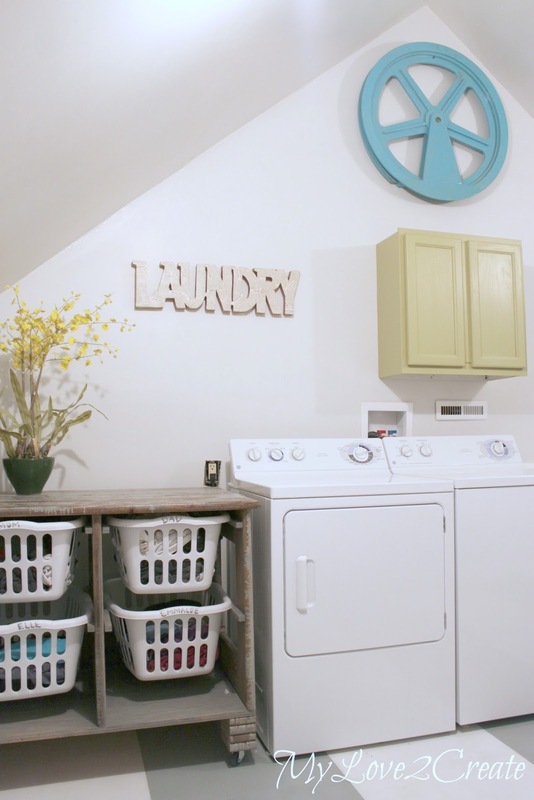 This has to be one of the best laundry room makeovers ever. Pinned. 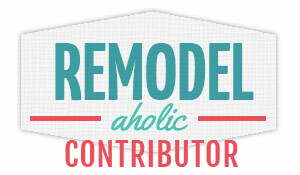 Would love to feature this on my linky party weekly roundup with a link back. This is absolutely amazing!!! 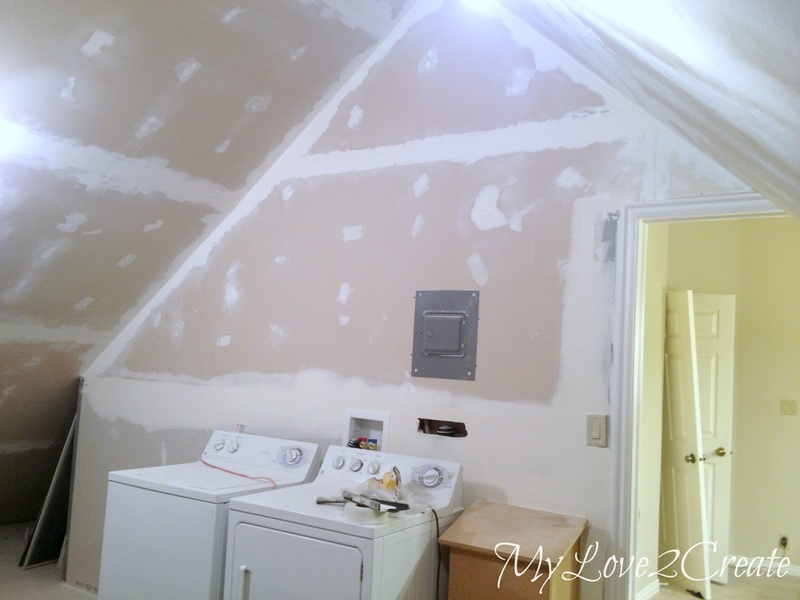 Best laundry room makeover ever! That rolling storage with the extra storage tucked away behind it...incredible! I am pinning this just in case I ever get a chance to do something like this. Visiting from Do Tell Tuesdays but you have a new follower now! 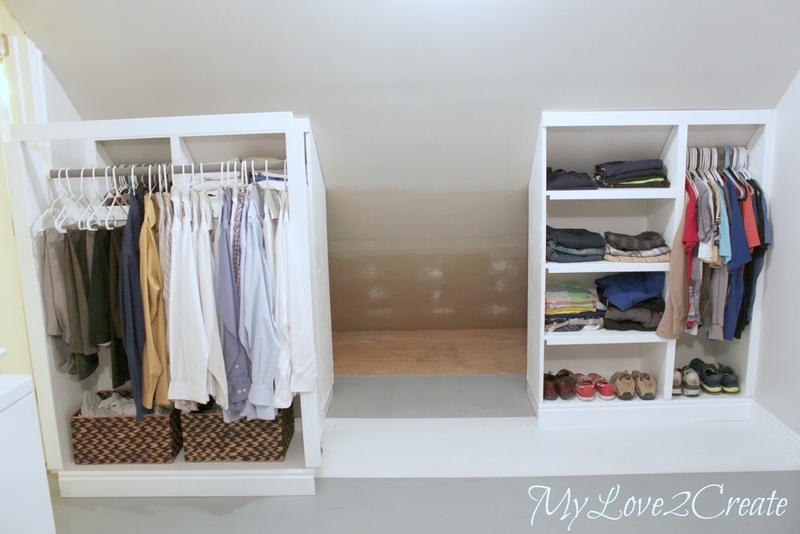 What a beautiful laundry/closet make over. I'll bet the laundry chore is a lot more enjoyable in that room. Man, WHO painted those shelves? Cause dang they look good! :) Seriously though, I LOVE this room. Someday when I have a real house, you are invited. OH.MY.HECK!!! You are so crazy and crazy talented! No wonder you were exhausted. 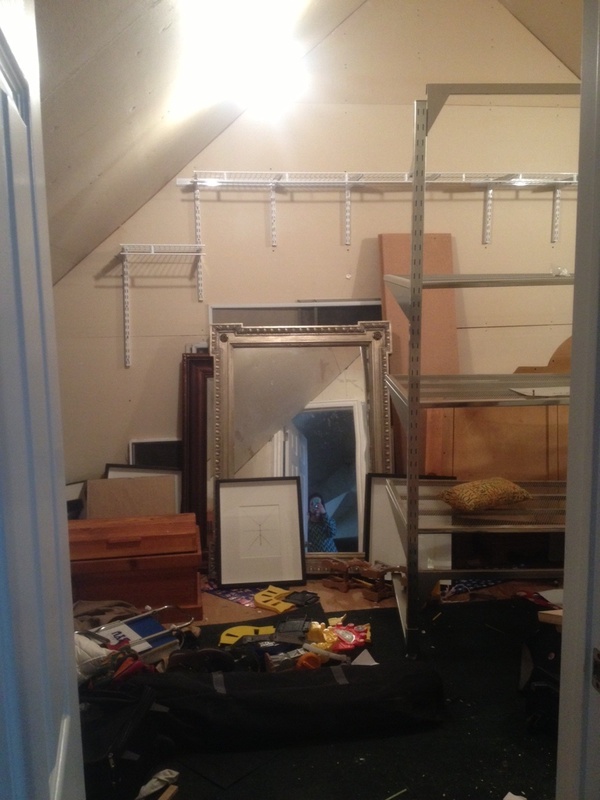 You didn't just do a closet, you did a whole freakin' room! Amazing!!! 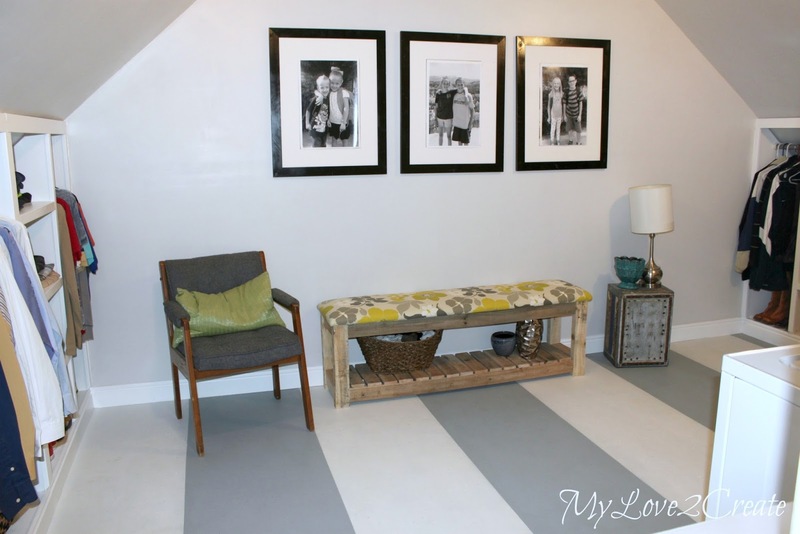 I LOVE the painted floor! This is an amazing transformation...and in only 6 days? Crazy wonderful! I love the rolling shelves under the eaves. Thanks for sharing this at What We Accomplished Wednesdays! Have a super week! Shut the Front Door!! 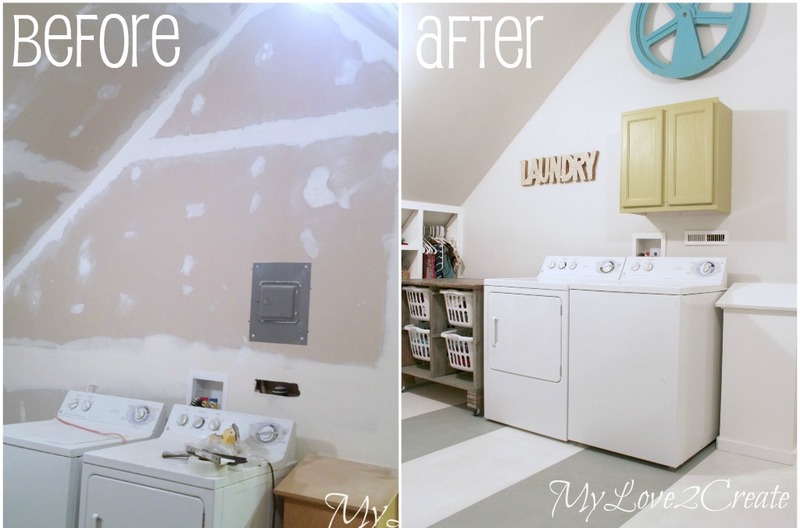 There are no words to how awesome this laundry room transformation is! Rolling walls? Painted floor? Laundry folding crate station? Wow. 6 days!!!! Seasoned carpenters would take way longer than that. You are incredible!!! And the room is gorgeous! Absolutely amazing! I am blown away. This room looks bigger then my bedroom, so jealous. Featuring on Friday at Bacon Time! HOLY COW! This totally blows my socks off. You are AMAZING. 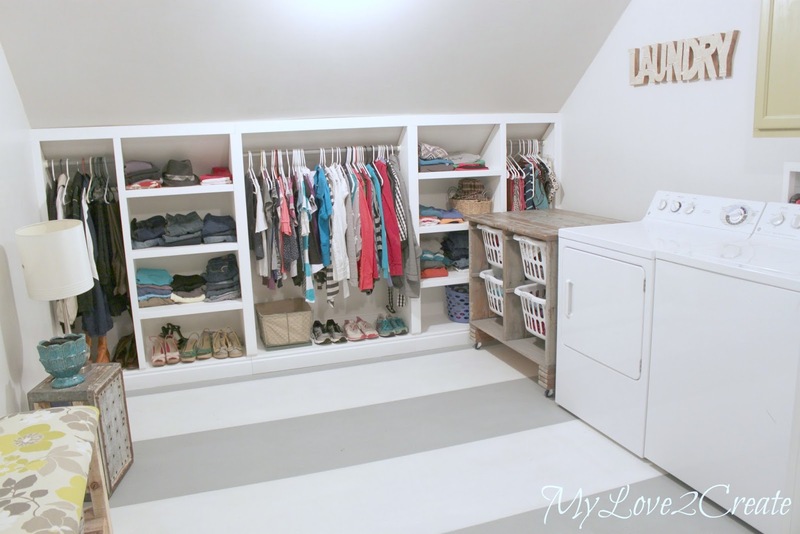 Your sister must love you for helping her create a DREAM laundry room. Wow. Wow. Wow. This is amazing! Love the stripes and the bench and, well, everything! Cannot believe you did it in 6 days. Amazing washroom......not a detail was missed. Nice job. LOVE it. You are amazing, all of you. It has everything, storage, closet, place to put laundry, folding table... plus a washer and dryer and great stuff to look at. 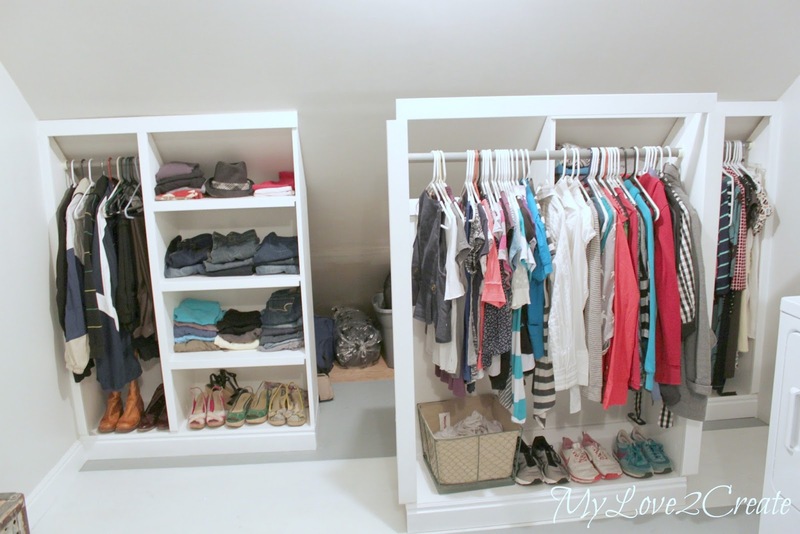 You inspired me to built closet towers for my daughter's closet and now you are inspiring me once again. Thanks for sharing. 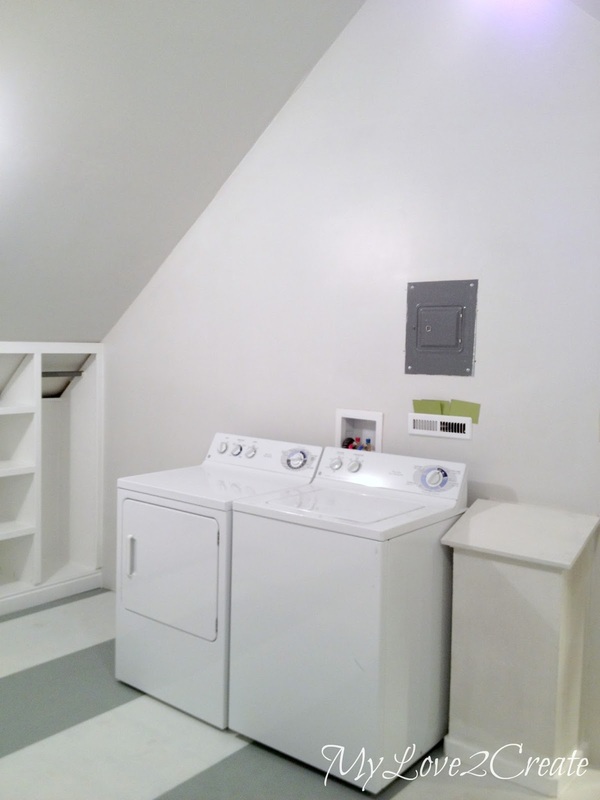 It looks amazing and you have every reason to be proud of this laundry room. You are a genius . . . . I hope that's ok to call you a genius. It's not REEALLY like name-calling when you're a youth, but sorta. But, I think it suits you! YOU ARE A GENIUS!!! I absolutely love that space. Thanks for sharing!! !